On it's 20th anniversary, Mega Magazine selected 20 Pinoys who made their mark globally. Those that were chosen "had to go against great odds and emerged more compassionate worldly and also more rooted to the Philippines." For more information about the Global awardees and their accomplishments, read about them in the June issue of Mega magazine. The event was held at the Rizal Ballroom of Makati Shangrila Hotel. It was an elegant evening of fine dining and entertainment. Manny O's Wines and bubbly kept us in high spirits. Commes toujours, the guests came dressed to the nines, reiterating once again the fact that we are among the most "fashionista" people in this part of the globe. The evening was capped by Furne One's avant-garde collection. Sari Yap, Mega's founder and Editor-in-Chief did the honors of introducing him as one of Mega's earliest talents. Let's drink to the next 20 years of Mega, the Philippines' Best Fashion Magazine. 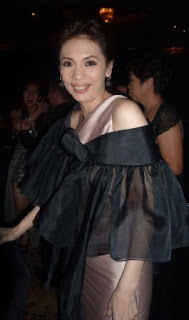 The brains and founder of Mega Magazine, Sari Yap. Knit Queen Designer who is now mixing Pina in her collection, Lulu Tan Gan and myself in an Ito Curata popsicle orange oooh lala gown. Events Associate of One Mega Group Elle Ong, so roaring 20s in a Jerome Lorico white fringed number and fiance, Arens Pe, also in a Jerome Lorico. 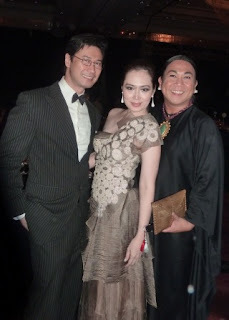 Leading man Cris Badiola with his leading lady in a Korean teleserye, Linda Ley, and fashion stylist Melo Esguerra. In Tan Gan Pina Filipinana, Xandra Rocha and Jessica Tan Gan.